White cake iced with vanilla butter cream icing and silver dragees on the side. 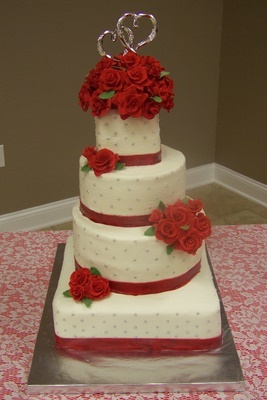 Roses and ribbons are made from fondant.Topper was provided by the customer. White cake iced with vanilla butter cream icing and fondant roses. The sides have musical notes, treble clefs and bass clefs. 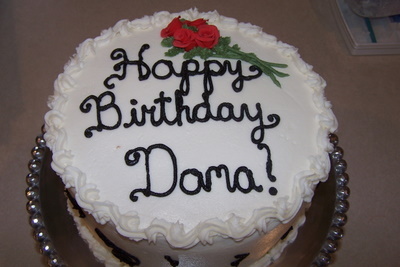 White cake iced with vanilla butter cream icing. 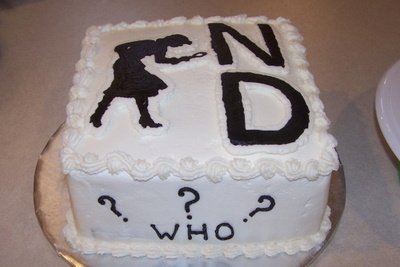 The ND and silhouette are frozen butter cream transfers. The sides say “Who”, “What”, “Where” and “When”.